Athena EPS follows hot on the heels of EPS Super Record and EPS Record. They were released only nine months ago. The ergonomics and design of the controls are the same as those used on the Ergopower Super Record EPS and Record EPS. We first used the Super Record version when we headed out to visit Campag towards the end of last year and we loved the feel. The thumb lever on the side of the control body is really simple to hit whether you’re seated or riding out of the saddle. It’s far easier to use than Campag’s mechanical equivalent. Another feature that trickles down from the Super Record and Record versions of EPS is the Multi-Shifting technology. In other words, unlike first generation Shimano Dura-Ace and Ultegra Di2 designs, you can just hold the levers down to move across two or more sprockets. You don’t have to press the levers more than once. 2013 Dura-Ace, Di2, by the way, has caught up in this respect. 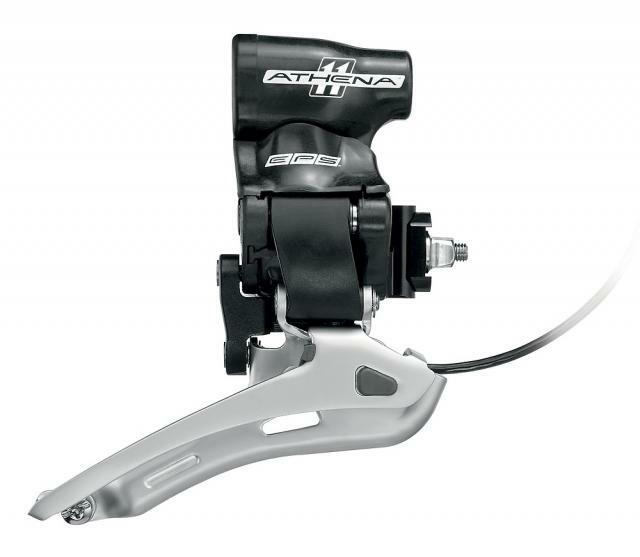 The front derailleur uses the same design as the Super Record EPS but with different materials. An aluminium alloy is used in place of carbon fibre. The automatic re-alignment function – auto trim, if you like – is also available on Athena EPS. In other words, the front derailleur will move automatically when you shift across the cassette to avoid the chain rubbing on the side of the cage. Yes, it’s a small point – trimming the front mech on a mechanical system is hardly the most arduous task known to man – but it’s a neat little feature all the same. 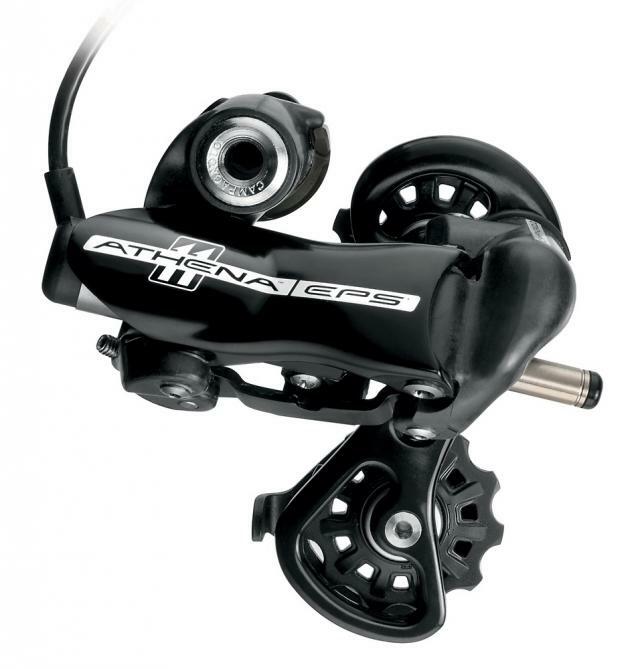 The Athena EPS rear derailleur’s geometries and design are the same as those of the Super Record EPS and Record EPS range. Athena EPS is equipped with the Ride Back Home technology as well. That means that if the battery does run out you can uncouple the mechanism of the rear mech; you can position it on a sprocket of your choice and it’ll stay there. It’s very unlikely that you’ll ever need to use this because the battery lasts up to 1,250 miles (2,000km) – depending on how often you shift gears, obviously – or six months on standby. Campag use their Mega G3 design at the rear. That means they use an oversized driveside hub flange and their distinctive spoke pattern. You get 14 aero spokes on the driveside and seven on the rear, and they’re grouped together in threes. The idea is to provide the perfect balance of spoke tensions on both sides of the wheel, reduce stress and increase rigidity. The Scirocco H35mm will also be available in a Ciclocross version – you can work out the translation for yourself. That means you get extra sealing – which can be an advantage for winter road conditions in the UK, never mind heading across muddy fields. The Zonda has been given an overhaul too, and Campag reckon the stiffness and energy transfer have been boosted thanks to the Mega G3 oversized hub flange. The Zonda is available in both standard tyre versions and in 2-Way Fit – which allows you to use either a tubeless system or a normal clincher and inner tube. We don't yet have prices on the wheels and all the Athena EPS prices given here are provisional.